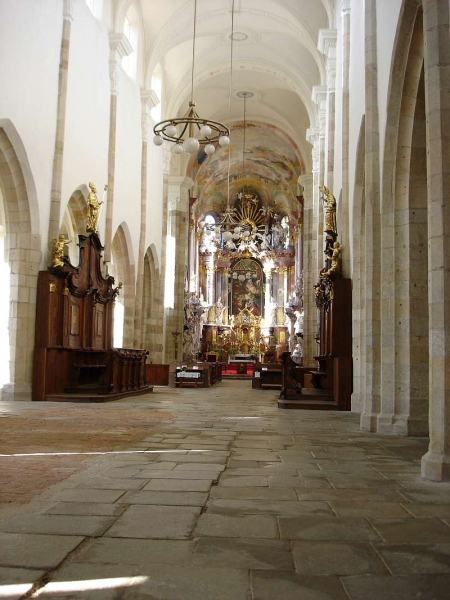 The Monastery church of Zlata Koruna shelters a well preserved Baroque organ from 1698-1699. 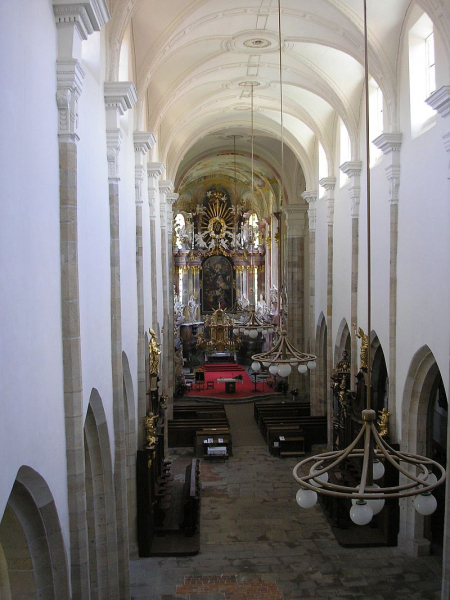 It was built by Abraham Starck z Lokte (1659-1709), the founder and the most prominent organ builder of so called Loket school. This school was functioning from the 17th to the beginning of 19th century. 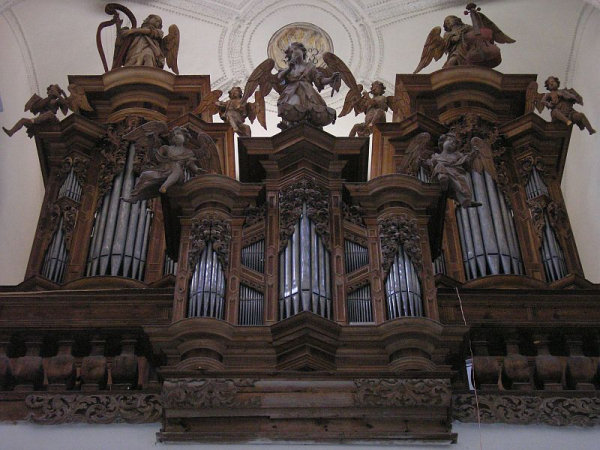 There was a number of restaurations: 1898 J.Fischpera lowered the tuning by physically moving the pipes by a semitone. 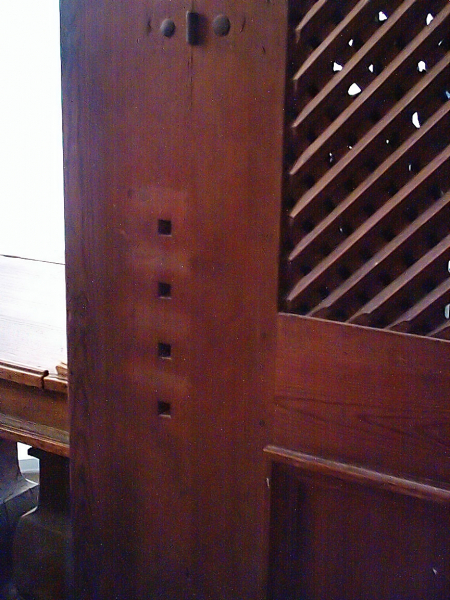 He also located the drawstops of the RückPositiv onto the stop jambs in the vicinity of the keyboards. 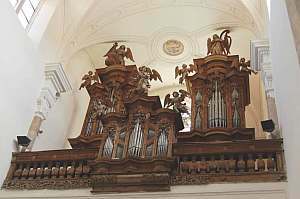 Originally, these were placed directly on the RückPositiv itself - though behind the the organist. 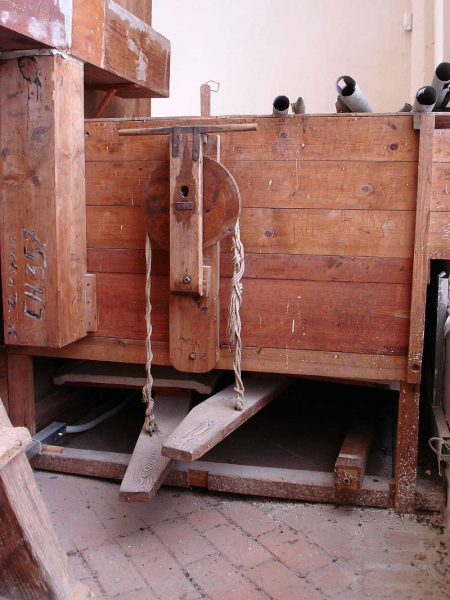 The original placement of the RückPositiv drawstops may still be observed on the picture. Other, this time very unfortunate restoration, was done in 1941 by E. Hruby. He replaced some of the aliquote stops (both Quints in HW, Quint and Octave 2 in RP) by new "romantic" string stops of the fashion of that time. Besides that he changed the order of keyboards. 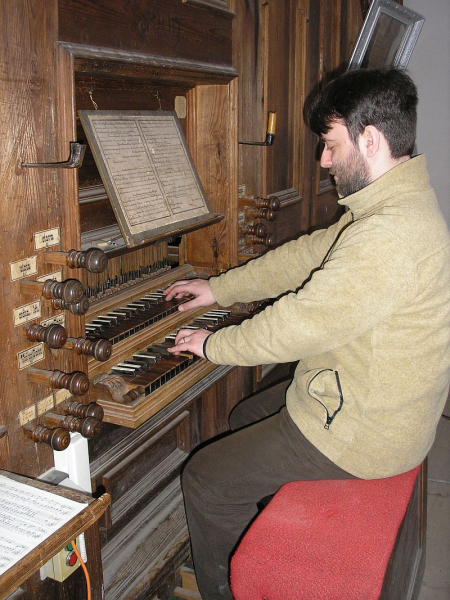 Originally, the RückPositiv was played from the lower keyboard, the HW from the upper one. Now, the lower keyboard is the Hauptwerk and the RückPositiv is the upper one. The original pipes were fortunately preserved, so the organbuilder Vladimir Slajch put them back to their original place during the latest restoration around the year 1984. 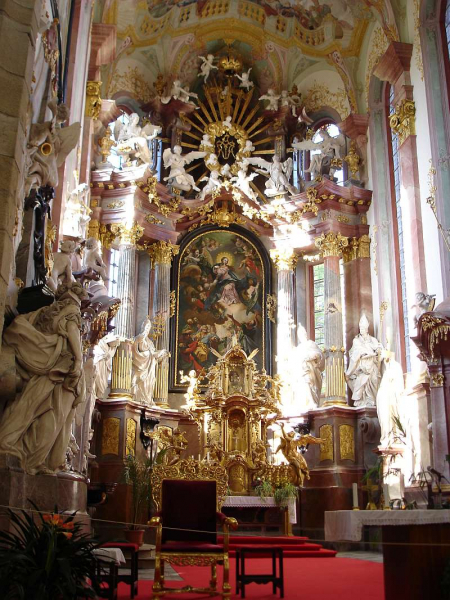 The Baroque short octave is preserved up to the present times. 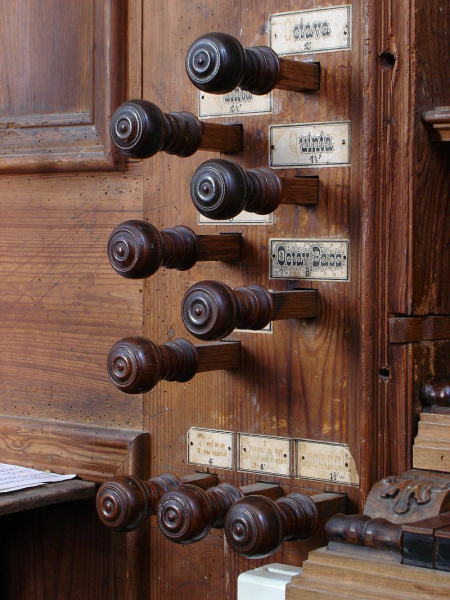 The pedal division offers one curiosity which is sometimes observed in the Czech Baroque organs. In the upper octave, the semitones play the lower octave as they are missing there because of the short octave mechanism. 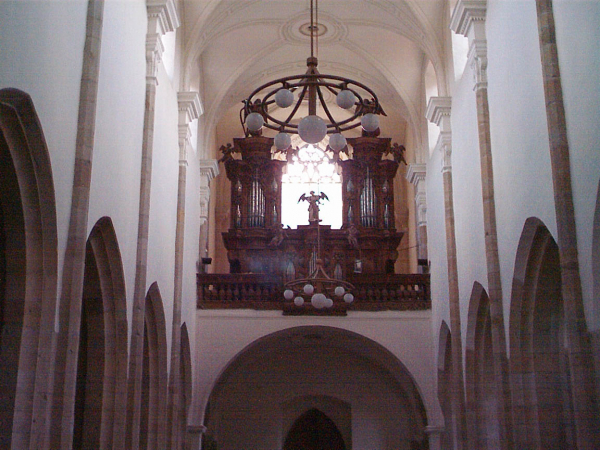 Sonus Paradisi had the honor to record the organ back in 2003. It was one of our first sample sets. At that time, the technology allowed the recording of the quality good for Hauptwerk version 1 of those times. In 2009, we were allowed to do completely new recording, covering all the advanced Hauptwerk 3 features, the multiple releases being the most important feature for the wet version of the sample set, but also making new dry recording for the dry version of the sample set. Both these versions are now available under the name "Zlata Koruna v.2". The Mixtura in HW has also a third included as one of its ranks what is rather traditional setting in old Bohemian organs. 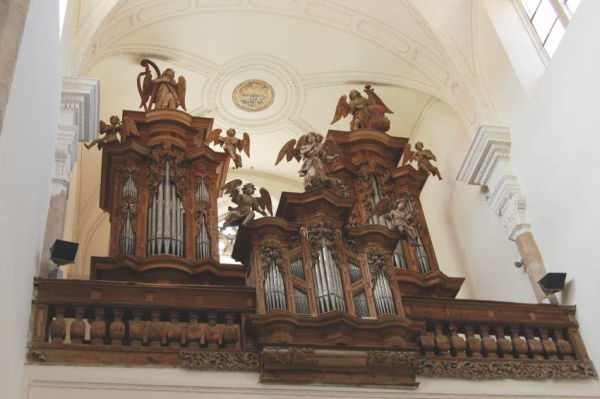 It gives very special timbre to the organ pleno. The Mixturas are bright and strong compared to other stops. four octaves, the bottom octave is short. The sample set is available in 24 bit depth and 48 kHz sample rate. Available in a dry and a wet version. No encryption used - plain wave format available. The reverberation time up to 5 seconds. Dual touch-screen supported (separate left and right stop jambs available). The compass of the manual is four octaves C1-C5, pedal originally C1-a2. The short octaves are maintained in the original version of the ODF. The compass is extended digitally in Hauptwerk to F5, pedal to D3 in the extended version of the ODF, in the dry and also in the wet version. Multiple loops, multiple releases (3 levels for most ranks) supported. Special temperament chart provided for the original tuning of the organ. Quinta 1 1/3' Mixtura 3x (1') all possible couplers added in the extended version.